These bee charms are a great addition to our honey jars or any project you are personalizing. 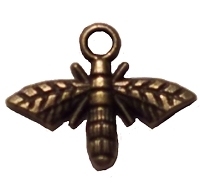 We have a bronze colored bee charm which measures 3/4" x 1/2". The tibetan silver bee charm measures 13/16" x 5/8".